Madinat Zayed, 21 February 2018 – مرحباً (Marhaban!) 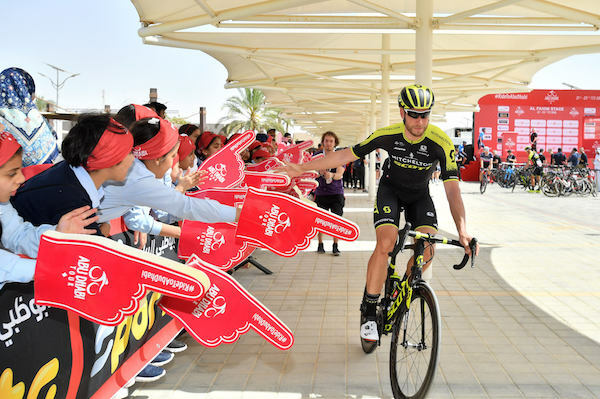 from Stage 1, Al Fahim Stage, of the fourth edition of the Abu Dhabi Tour (21 - 25 February 2018), the only WorldTour race in the Middle East and organised by the Abu Dhabi Sports Council in partnership with RCS Sports and Events. Starting and finishing in Madinat Zayed, the largest town and the administrative centre of Al Gharbia, the largest and westernmost region in the Emirate of Abu Dhabi, and raced almost entirely in the desert (189km), it's an ideal scenario for a final bunch sprint. During the stage, 36 Green Jersey Points (of a race total of 164), 16 Black Jersey Points (of a race total of 64), and 16 seconds in time bonuses are up for grabs. Details of time bonuses and the various sub-competitions are given below. The ceremonial roll out started on schedule at 12:10. After crossing the 6,200m neutralised zone, the peloton of 138 riders passed km 0 at 12:23. Did not start 82 - Armee Sander (Lotto Soudal). After crashing in the neutral zone of Stage 1, Mark Cavendish has been forced to withdraw from the Abu Dhabi Tour, after 5km of racing. During Stages 1 and 2, for the first time in a WorldTour race, a 360° camera will be installed on a rider's bike. Another such camera will film in the starting area on Stage 1. On following days, a dedicated video will be published on the Abu Dhabi Tour and Velon's channels. Every day, after each stage, the top data highlights gathered from riders throughout the race will be available and shared with the media. 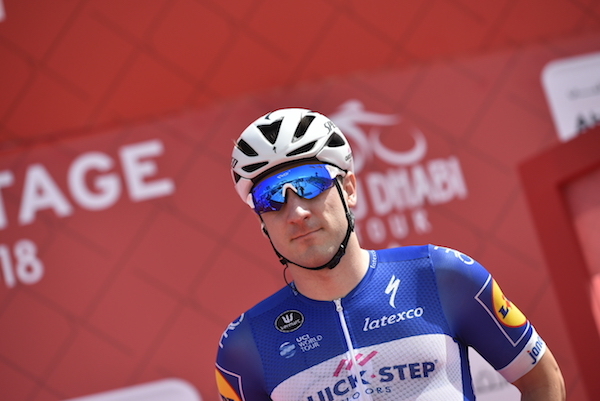 Riders' performance data will be recorded for the third time at the Abu Dhabi Tour to enrich the live coverage by unique insights about the riders' performances. Compared to previous editions, the number of riders equipped with monitoring devices is on the up: 55. For the fourth year running at the Abu Dhabi Tour, onboard cameras will be used for a daily video highlights program and clips will be available online. Stage 1 is entirely in the desert. The first and last sections, each of approximately 45km, are on straight, wide roads in the desert. After the first intermediate sprint at Liwa, the road continues in the desert with a series of undulations to be tackled twice thanks to a U-turn at Boa, resulting in a significant total difference in altitude. Following a second passage at Liwa, there is a brief loop up and back down through the sand dunes. The third passage at Liwa will mark the second intermediate sprint before the straight 45km return section, which leads the riders towards the finish at Madinat Zayed. The final section is a fully urban course with only two proper curves, one to the left and one to the right. The straight, wide roads featuring wide ranged roundabouts, with the final, flat stretch on tarmac. 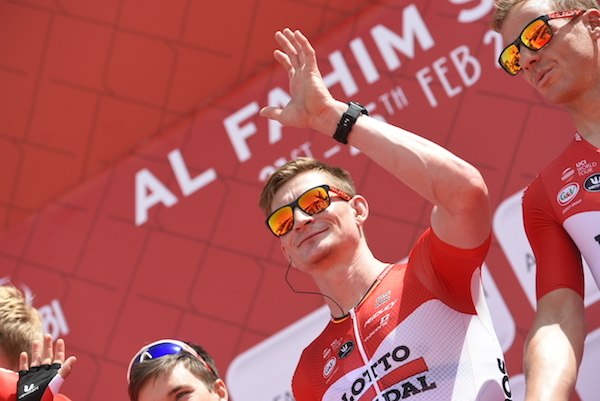 The Red Jersey, sponsored by Al Maryah Island (General individual classification by time), and the White Jersey, sponsored by Abu Dhabi Sports Channel (Best Young Rider born after 1 January 1993). Stages 1, 2, 3 and 5 have two intermediate sprints and a maximum possible 16 seconds of time bonuses. The maximum possible time bonuses for the whole race is 64 seconds. NOTE: Green Jersey Points - Intermediate Sprints: 8, 5, 3 and 1 points for positions 1, 2, 3 and 4 in Stages 1, 2, 3 and 5. Finish line points in each stage: 20-16-12-9-7-5-4-3-2-1 (points for first ten riders). A maximum possible 36 points are up for grabs in each of stages 1, 2, 3 and 5; and 20 points are available on stage 4. NOTE: Black Jersey Points - Intermediate Sprints only: 8, 5, 3 and 1 points for positions 1, 2, 3 and 4. A maximum possible 16 points available for each of the first three stages and Stage 5. No points available in Stage 4. ‘Where the desert meets the sea’, Al Dhafra makes up over two thirds of the Abu Dhabi emirate. Along its hundreds of kilometres of coastline are stunning beaches and islands, which are gradually being developed for visitors. Al Dhafra’s history is encompassed in the myriad of ancient forts, which dot the landscape, and together present a snapshot of this region's fascinating history - all set against dramatic landscapes. This top class education complex with four-storey buildings to accommodate more than 3,000 students includes a 1,200 seat auditorium, libraries and sport facilities. Madinat Zayed, the administrative centre of the Al Gharbia region with 29,000 inhabitants, was founded in 1968 by Sheikh Zayed bin Sultan Al Nahyan. The main tourist attraction of the town is its camel racing track. Shams is one of the world’s largest solar power stations, with a capacity of 100 megawatts covering an area of over 2.5 square km. Its impact can be compared with planting 1.5 million trees or reducing the road traffic in the country by 15,000 vehicles. A historical oasis at the outskirts of the legendary Rub Al Khali (Empty Quarter), in the Al Gharbia region. Liwa is famous for its vast desert sand plains and high dunes. It features a large date palm plantation of over 100,000 trees-an ecosystem that has been officially recognized by the Food and Agriculture Organization of the United Nations (FAO), as it is a valuable mine of genetic resources and biodiversity, and a site of great cultural heritage. Set in the middle of the Rub’ al Khali or Empty Quarter, the world’s largest uninterrupted sand mass, Qasr Al Sarab Desert Resort by Anantara is isolated from the outside world, yet is less than 200km away from Abu Dhabi. There is also a range of excursions that reflect the region’s ancient cultural traditions including early morning desert walks, camel treks, archery or mountain biking through awesome scenery. Madinat Zayed, the administrative centre of the Al Gharbia region with 29,000 inhabitants, was founded in 1968 by Sheikh Zayed bin Sultan Al Nahyan. The main tourist attraction is its camel racing track.